Rep. Eric Swalwell (D., Calif.) said in a recent interview that he believes Democrats need to start going on Fox News, saying that they "have to go into that arena." Swalwell, who has appeared on Fox News several times, told the Daily Beast in a recent interview that he believes that his Democratic colleagues have to go on the Fox so that the network's largely conservative audience can get a more rounded picture of the Democratic Party. The 38-year-old congressman said that he has only met President Donald Trump once, but Trump said he recognized him from TV during the encounter. It is unclear where Trump recognized him from, but Swalwell appeared on Tucker Carlson's primetime show the night before the meet-and-greet. "I happened to be the last person in the line," Swalwell said. "I brought a letter to give to him from a Muslim constituent who had concerns about his Muslim ban. And as I’m handing him the letter, he looks at me and goes, ‘I know who you are. I’ve seen you on TV.’"
The congressman has made a personal effort to do more conservative media and is hoping others in his party will do the same; not just so that Trump can recognize them before White House meet-and-greets, but so that an audience that is intrinsically hostile to Democrats gets a more rounded picture of the party. It’s not an approach without risks. 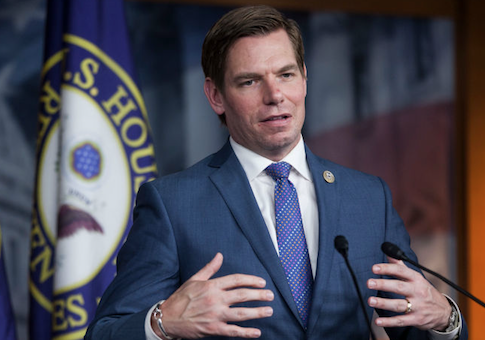 In Swalwell’s case, death threats have followed some of his appearances. But the congressman, who said he has been doing Fox News hits since getting invited on Sean Hannity’s show in his first weeks as a member of Congress, sees it as a net-plus. "I think you have to go into that arena absolutely," Swalwell advised. "You’re not going to win all of them but you can win enough of them. That’s how I see it." While Swalwell isn't the only Democrat to go on Fox News, some of the others have been more opportunistic in their appearances as they were trying to win reelection last month during the midterms. Sen. Claire McCaskill (D., Mo. ), who recently lost to her Republican opponent Josh Hawley, and Sen. Joe Manchin (D., W.Va.), who easily won his reelection bid, both appeared on Fox News multiple times trying to appeal to Trump supporters and convincing them that they were accommodating to Trump's agenda. When asked whether Democrats should go on Fox News, Manchin said, "Absolutely." "Absolutely. They should—Fox News? I go to Fox, CNN, MSNBC. I go to all of them. I just feel comfortable because what I’ve got to say is the same, no matter where I’m saying it," Manchin said. This entry was posted in Politics and tagged Claire McCaskill, Eric Swalwell, Fox News, Joe Manchin. Bookmark the permalink.